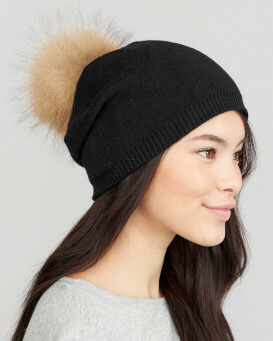 You'll be sure to glow everyday with this amazing Jewel Slouchy Knit Beanie with Finn Raccoon Pom Pom in Navy for women. Jewel studs bedeck the beanie with a tack at the back for the perfect slouchy fit. A large Finn Raccoon pom pom is dyed navy and is removable at your convenience. The double lined feature makes the lining comfy to your head. This lightweight design is acceptable for fall or winter. Feel free to hit the ski slopes or simply set out on the town in this fashionable beanie. 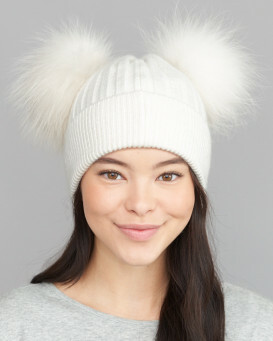 Whatever you want to wear, this hat is perfect everyday. "This is beautifully made and soft. It arrived on time and perfectly wrapped. Cant wait for the cold weather to arrive." "Just stunning .. I bought a grey and navy one and had real trouble deciding which one to gift and which one to keep as I wanted them both...! Can I just mention also that it was delivered in 3 days from Canada to the UK - amazing. I love this website and have lost track of the things I have bought over the years now ..FABULOUS ." "Great little hat - soft, pretty and keeps out the cold. I like the bit of sparkle on it. My husband says it looks cute on. Very comfortable to wear and I can stow it in my handbag." "Amazing! 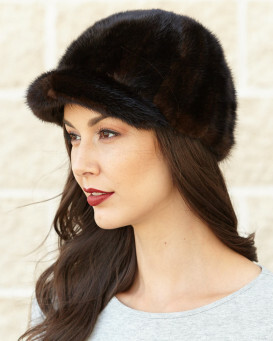 This hat is so soft and the "tuck" in the back makes the slouch perfect!" "Fantastic product, stylish and good quality! Very pleased with this purchase." "Super soft and slouchy. I bought the navy and grey coloured beanies and both the knit and fur we're true to colour. The spray of sparkle on the front is an added bonus." "I gave this to my granddaughter in Denver."